Bamboo fence panels are easy to install and can be used to visually divide your garden into different areas, as well as being useful for transforming yards and creating privacy. Mahogany bamboo fencing are made from natural fencing pieces that have been dyed in tones of deep red to provide a unique look for your projects. They are easy to install and have been built with the finest commercial grade materials that can be shipped right to your door with no shipping fees. Mahogany bamboo fencing is one of the most popular products among homeowners and home designers these days. This type and color of bamboo has been a very unique addition in the world of traditional natural bamboo fencing. This beautiful product is a must have for anyone looking to add a little something extra to their home décor, inside or outside of the home. 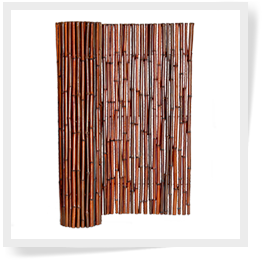 This particular bamboo fencing is extremely versatile and can be used to decorate your home inside and out as mahogany bamboo in itself offers a very unique and beautiful design look. Mahogany Bamboo fencing can be cut in a variety of shapes and sizes to fit seamlessly into your home or garden fence projects. It is easy to cut this type of fencing into smaller sections or tie them together to create a longer fence. You can use them to create a wonderful pond or garden surround, or use bigger sheets to fence your entire backyard and make your very own private oasis. 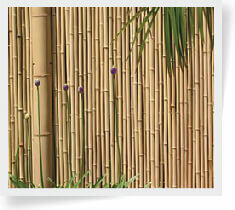 Bamboo is a highly sustainable product and can be used as a better alternative to traditional wood fence materials. Wood fencing requires a lot of chemicals to be used during the harvesting and transportation process. Bamboo fencing endures an eco-friendly process during the harvesting, manufacturing and processing phases. Mahogany bamboo fencing can be implemented into many of your projects. Sizes include: 1" X 3' X 8’, 1" X 4' X 8’, 1" X 6' X 8', and 1" X 8' X 8'. Mahogany bamboo has all of the benefits of natural bamboo fencing along with an attractive deep red hue that can add a pop of style to your home projects.